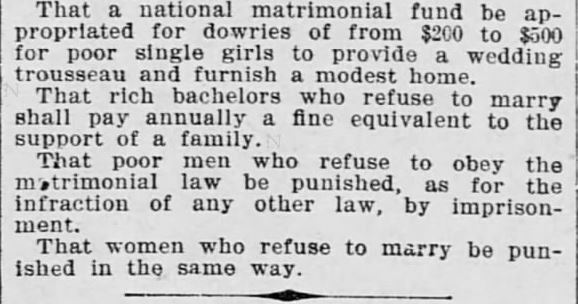 I endorse newspaper articles as an original source in researching Victorian-era America. Yet while I trust–for the most part–newspaper articles to be a reasonable representation of attitudes, circumstances, happenings, and differing opinions, I’m well aware that not everything in print is fact…at least as presented. 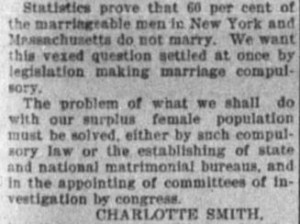 When researching Matrimonial Bureaus for my 12-part series of Mail-Order Bride SCAMS in the 19th Century, I came across newspaper articles mentioning Mrs. Charlotte Smith, presented as a rather ridiculous woman seeking legislation to force marriage upon the matrimony unencumbered. Three such articles follow, all of which are from credible, well-respected newspapers of the late nineteenth century. But don’t stop reading there. At the bottom, I’ll share more of who Mrs. Charlotte Smith was, the platforms she supported, the work she did–and cast an entirely different light on her nature than these newspaper reporters suggest. Statistics prove that 50 per cent of the marriageable men in New York and Massachusetts do not marry. We want this vexed question settled at once by legislation making marriage compulsory. 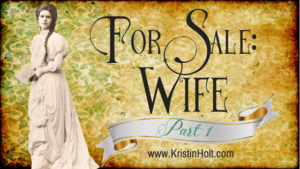 There is no sentimentality in Mrs. Smith’s consideration of matrimony. She regards it merely in the light of a curative agent, and says if it becomes universal there will be no more immorality. 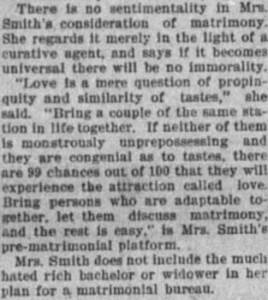 Mrs. Smith does not include the much hated rich bachelor or widower in her plan for a matrimonial bureau. ~ The Leader-Democrat of Springfield, Massachusetts, on 2 December, 1897. The previous transcription comes from the two-part newspaper clipping, below, which is a challenge to read. The following images aren’t meant to be readable–just to provide the context and source of the quote, above. 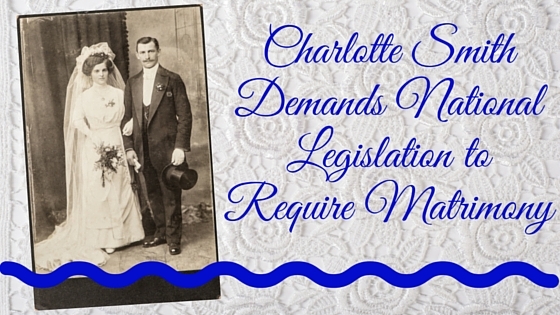 Charlotte Smith demands national legislation to require matrimony. 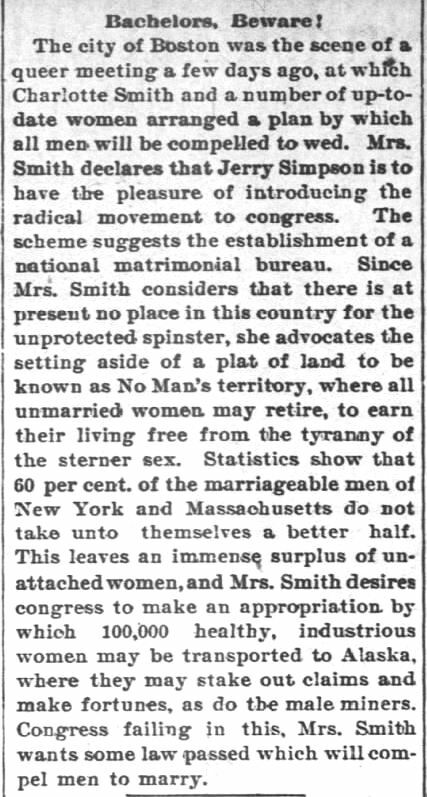 The Leader-Democrat of Springfield, Massachusetts, on 2 December, 1897. The Leader-Democrat of Springfield, Massachusetts, on 2 December, 1897. The Council Grove Republican of Council Grove, Kansas, on 1 October, 1897. The Saint Paul Globe of St. Paul, Minnesota. 9 January, 1898. Mrs. Charlotte Smith sounds a little crazy, doesn’t she? In context of these newspaper articles, she seems more than a little civil-rights-disrespecting, a bit more than a zealot, and whole lot embattled. Other sources of history indicate otherwise. How do I know the Mrs. Charlotte Smith mentioned in the newspaper articles is one in the same with Charlotte Odlum Smith covered by Wikipedia? 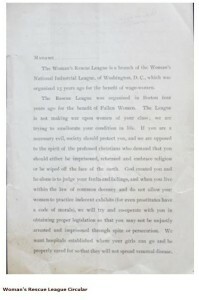 “The Woman’s Rescue League is a branch of the Woman’s National Industrial League, of Washington, D.C., which was organized 15 years ago for the benefit of wage-women. 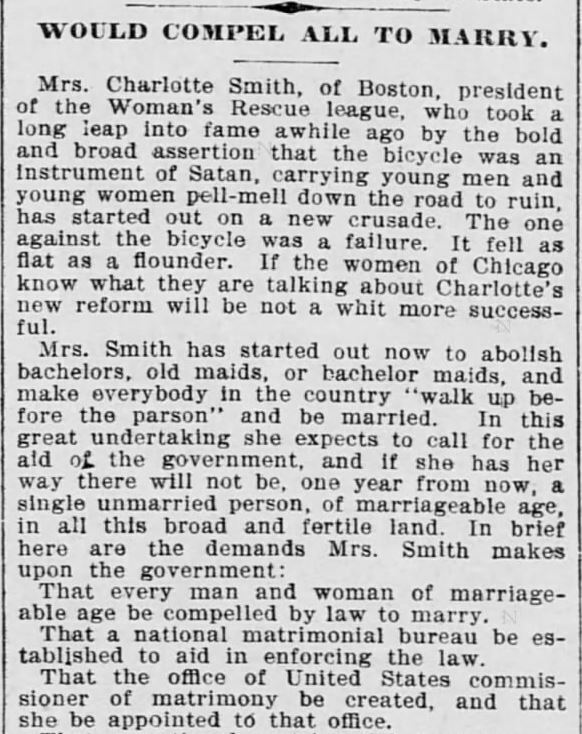 Remember the newspaper article (3rd of 3 above) referencing Mrs. Smith’s attack on bicycles? You’ll find it here, at Forgotten Stories. Note that Mrs. Smith signs the letter Charlotte Smith, President, Woman’s Rescue League, Washington D.C. The locations, timeline, and references to professional organizations all match. When reading and listening to Island of Vice: Theodore Roosevelt’s Doomed Quest to Clean Up Sin-Loving New York, by Richard Zacks, it became readily apparent that Theodore Roosevelt (while serving as Police Commissioner for New York City in the 1890’s) frequently insisted he’d been poorly represented in the papers. Reporters slanted his statements, took them out of context, and skewed public sentiment, often unfairly. Roosevelt often took umbrage to what he called “absolute untruths” published about him. 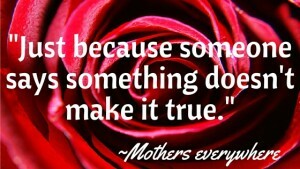 Just because someone says (or publishes/prints/posts) something doesn’t make it true. As amateur historians, I submit it’s prudent to consider the source–and examine many different such source documents prior to making an informed decision. About any historical person, whether it be Mrs. Charlotte Smith, Theodore Roosevelt, or anyone else.